Wow. 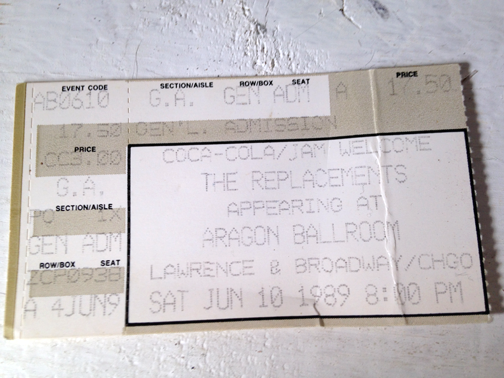 Watching all the shows for the Back By Unpopular Demand tour unfold—or rather EXPLODE—proves that truly, The Replacements owe us nothing. It’s probably not a coincidence then that The ’Mats played I.O.U for their second encore at the Portland show. Note the little smile from Paul at the end of the video above. In fact, they closed many of their 2013 fest shows with that rocker, too. If recent fan and critic reports coming out of their two-night stint at L.A.’s Hollywood Palladium are any indication, the train kept a rollin’! “You could feel and see the room swell with energy and joy, both on stage and in the wildly dancing, lyrics-shouting crowd – which didn’t, and nearly wouldn’t, go home when the Replacements were done,” said Peter Larsen of the Orange County Register. Paul Westerberg throws his SG to guitar tech during second night of L.A. show. Photo courtesy of @joshfreese on Instagram. Well, here you have it, boys, in writing. Epic. It’s a word that gets tossed around a lot, to the point that it loses it’s meaning. But I think the use is appropriate here—in reference to the above clips from the April 10 Portland show. I’ll save the analysis for the music critics…. Thank God (or the Devil) for the Blues—that primordial ooze which eventually morphed into rock ’n roll. The essence of all popular music. Do you ever get the blues? I don’t know about you, but I’ve got a case of Post–’Mats Show Blues. It happens every time I’ve seen ‘em. You replay the show in your mind, over and over. You wish you were onto the next show. Which I guess is why sharing the above video feels so good. We can keep it going. “You’ll get the blues all night,” Paul threatened after the above number, which we‘ll call “Whole Foods Blues” for now. Later, he grabbed a harmonica and just riffed away. One fan then called out to Tommy for “Little Village,” a 15-minute-plus recording by Sonny Boy Williamson the ’Mats made WXRT-Chicago (93.1FM) DJ Johnny Mars (or was it Frank E. Lee?) play during a 1987 interview. Fortunately (or unfortunately) that cover didn’t happen live. Now if only they played a Stones cover, maybe my mood would be a little less dark today? Nah! Thanks to the kindness of friends, we were able to get in a bit earlier. Turns out we ended up right in front. Didn’t expect that. The stage was much smaller than I remember. In fact, it was probably the most intimate-feeling show I’ve seen at this venue. Possible reason—I didn’t drink during the show. As it was an all ages show, the Crystal separated the drinkers from the kids. At other shows like Dinosaur Jr. or Archers of Loaf, I ended up at least 20-30 feet away, behind the “beer barrier.” Sober at a Mats show? Well, kinda…and it was worth it! The Young Fresh Fellows kicked off the antics and didn’t disappoint. I especially liked their cover of Slim Dunlap’s “Loud Loud Loud Loud Guitars.” Their drummer Tad Hutchison is phenomenal! In fact, the whole band was just plain tight! Watch an Instagram video of YFF tearing it up before The ’Mats. Post YFF, the antsy crowd was kept slightly at bay with Sam Cooke, Otis Redding and other classics on the overheads. Mayhem quickly ensued however, as the lights dimmed and “Surfin’ Bird” by The Trashmen started blasting. Paul comes running out, does a little chicken dance lap around the stage, followed by his mates. You can watch that footage now, if you wish. They launched straight in with “Takin’ A Ride,” followed by “Favorite Thing”. I don’t have footage of that because I screamed along to the entire song and ruined the audio. However, you can watch a bit of “I Will Dare.” More video highlights to come! The crowd could not get enough, even after the first encore. I threw a bunch of old used 45s, including Les Paul, Paul Anka, The Partridge Family ( among others, they were supposed to be a gift!) onto the stage, just before Tommy followed the rest of the band offstage. He looked at me, then walked up to the records and just started breaking them and crushing them with his hands. All I could do was laugh. The band came out for one more, “I.O.U.” off Pleased to Meet Me. Pure rock ’n roll. What a way to end a show! Does anyone else out there have post-show depression? I miss The ’Mats already. Maybe I should just hit the road and follow ’em? “In my waxed up hair and my painted shoes…” Sigh. I mean, Tommy still owes me $1 for all those records! Holy crap! The mind reels. Ears still ringing. No Paul, thank YOU and the band for coming! 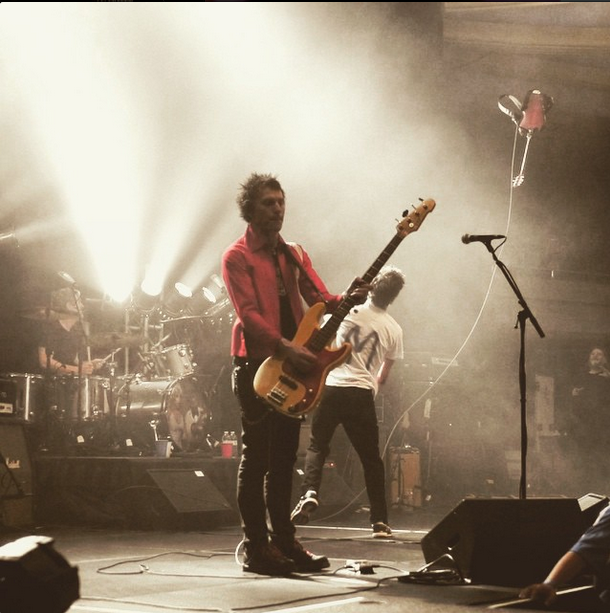 More clips from The Replacements live at the Crystal Ballroom coming soon. Stay tuned. What’s the cover? Where should we park? My first ever concert. My first real ticket stub. Note one of the sponsors: Coca-Cola! A 15-year-old girl wrote this, can’t you tell? A full deck of playing cards fell like snow. Loose change—pennies mostly—rained down on the ground. I dove for the cards. A friend skinned her knee on the pavement, grasping for what looked like a suitcase key. The ’Mats were up on high—leaning out of the Aragon Ballroom’s dressing room window after their ’89 Don’t Tell A Soul show in Chicago, dumping the contents of their pockets onto their faithful fans. There was beer, too. What a great way to end my first live show—waving up to my musical heroes. This was rock ’n roll. I was 15. I was in love. My dad had dropped me and my best friend off at the venue earlier that night (how punk rock is that?). I remember being embarrassed at this and rushing inside. The room looked huge to our young, innocent eyes. We picked GA seats (folding chairs) within the first ten rows. These chairs would later be kicked over and abandoned by a wild, drunken crowd. As I was in a Beatles-fangirl-like frenzy, I don’t remember much about their set, though maybe midway through, Paul left the stage. Fans and bandmates were confused. A spotlight then pops on, and Paul is up in one of the empty boxes next to the stage. They played Nightclub Jitters (I think? Or maybe it was Within Your Reach?). Whatever song it was, it was perfect. Paul’s voice was tender and moving. I hafta laugh now at my fondest memories captured on the above note card, especially, “the old ladies next to us.” Ha! They were probably in their 30s! God, I’m old now…wish I’d written more about the show on that damn card. My memory no longer serves me well. 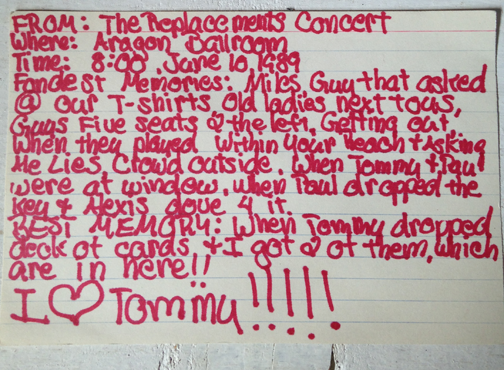 So yeah, that’s how my obsession with The Replacements started. Now where did I put my ticket for tonight’s SOLD OUT show?